Gateway to Africa Inclusive Growth decidedly isn’t another title to add to the overwhelming narrative on the subject, which the Author has extensively reviewed. Then, Dr Graziosi complemented the desk research with an extensive field experience in the Continent along with the profound expertise in development finance issues, in particular Credit Guarantee Fund/ Trust Fund/ Grant Facility/ Revolving Fund, which designed, managed and evaluated in fourteen Countries. 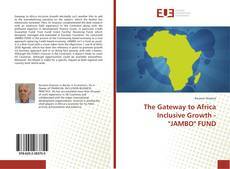 He conceived JAMBO FUND in the picture of the Community-based economy as a new approach replacing Credit-based economy. JAMBO isn’t a fund as usual; it is a Risk Fund with a vision taken from the Objectives 1 and 8 of SDGs 2030 Agenda, which has been the reference in point to promote growth via business approach and in so doing face poverty with jobs creation. Although the FUND’s horizon is the Continent, it doesn’t mean to cover 54 Countries, although opportunities could be available everywhere. Moreover, the Model is viable for a specific request at both regional and country level world-wide.